This article was originally posted in 1999. The mill is now in operation!! 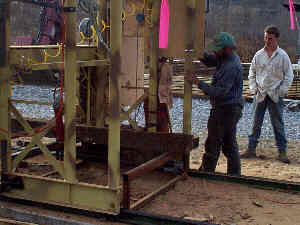 Bob has built a resawing fixture to process antique flooring from salvaged beams and 2x siding. Enjoy the building of the mill, shown here, along with new pictures of work in progress. The mill was designed and built by Bob Hoffa, who said "The essence of this mill is its tremendous and precise linear X and Y motion control that will make it capable of more than sawing." Custom Wheels Gantry in shop. Track Gantry on track. Not finding a reasonable size wheel for the bandmill, we decided to make these. 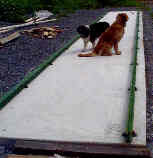 They are marine plywood composite covered with fiberglass and epoxy. A steel sprocket provides keyed hubs. 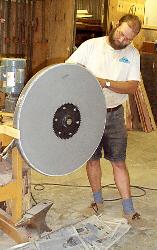 As shown here Bob used a gear motor to slowly turn each wheel for both applying epoxy and later truing with a router. 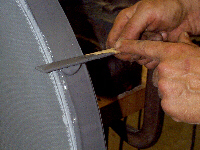 Later a neoprene tire was installed. 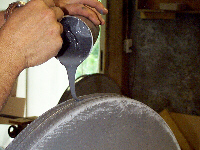 Each wheel is 30" in diameter. 40 feet of rail made from I beam and angle iron rest on a concrete slab. 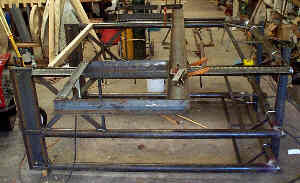 These rails will guide the gantry and have vertical adjustments for fine tuning in the event of settling. The gantry supports the mill and planer head. 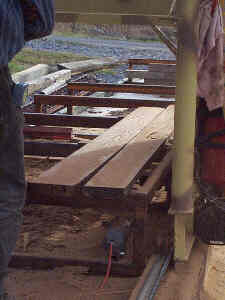 The log to be sawn or board to be planed remains stationary and the gantry moves along the rails. 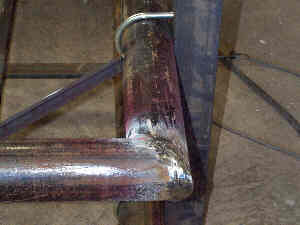 Dye penetrant was used to examine the welds and help determine where reinforcement was warranted. 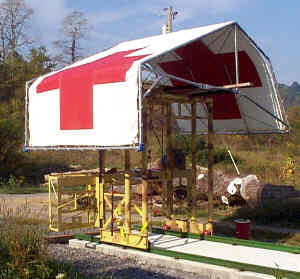 With a desert camo paint job and a sporty Red Cross tarp for temporary shelter, the gantry is reassembled on the track. The tarp is as much to protect Bob during final assembly as to provide shelter for the machine until a permanent structure can be built. 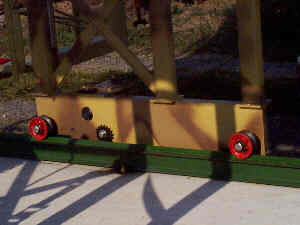 Close up of gantry wheels on the rails. After this picture was taken, additional guide wheels were added to smooth out gantry travel. These planer heads are 36" wide. One is conventional and the other helical head has 192 individual knives. What do these have to do with the bandmill? Stay tuned!! 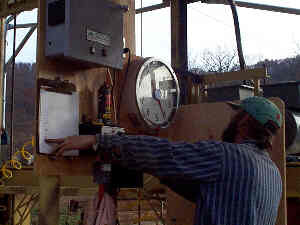 A redefined weight scale indicator shows blade height as Bob aligns the blade according to the tally sheet. Cutting more than one beam is possible, as the bed is capable of a 60' cut. 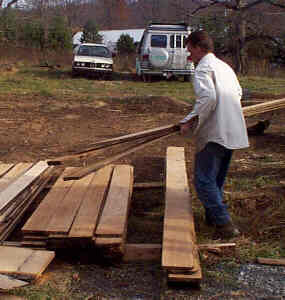 Resawn chestnut and virgin growth white oak boards from beams are stacked as they come off the saw.